This was one of those recipes that just happened. I had some really great ingredients and I was originally going to make an omelette when I decided to make a large salad instead. I was a little nervous but it ended up coming out amazing! Probably one of the best salads I've ever had! 1. Heat up a pan over medium heat. Spray with cooking spray. Cut the casing of the sausage and squeeze the meat into the pan. As it cooks, chopped it into small pieces and cook until cooked thoroughly. Remove from heat. 2. Spray pan one more time with cooking spray. Add onions and mushrooms and cook until tender. Sprinkle with salt and pepper and remove from heat. 3. 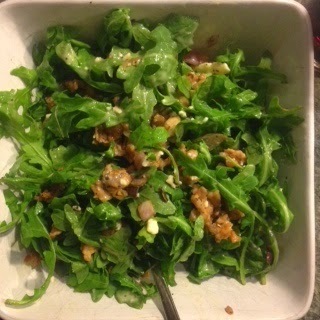 In a large bowl layer the arugula, the onions and mushrooms, the feta, and chicken. Toss with dressing and enjoy! !